This recipe is very similar to the roast beef dip sandwiches that I posted awhile back, but this is the barbecue version with chicken instead of beef. It's a crock pot recipe (my favorite kind), and it literally takes about 10 minutes to put it all together. This particular recipe is for 2 people, but you can add more if you're serving a larger crowd. Place chicken in crock pot. Cover generously with barbecue sauce, 1 tablespoon of brown sugar, the minced garlic clove, and large chunks of onion (place these directly on top of the chicken to add some flavor when it's cooking). Once you're ready to eat, butter the hamburger buns and place the cheese on one half. Let it sit in a broiler or toaster oven until the cheese melts and the bun is toasted. Remove the onion chunks from the chicken mixture. Unless you want them in there. Whatevs. Using two forks, tear the chicken apart so that it's nicely shredded and add more barbecue sauce (how much you add is up to your own discretion). 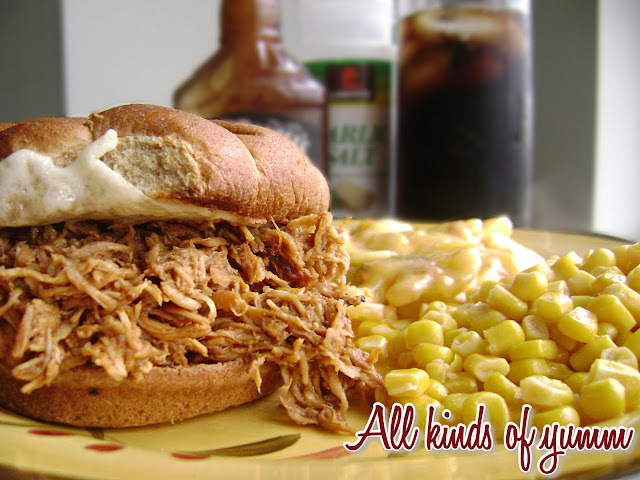 Place shredded chicken on the buns and serve hot. I served this with buttery corn and my cheesy scalloped potatoes. Did I mention that I'm allergic to tomato acid and this ruins me? I should also probably mention that it is completely worth it.